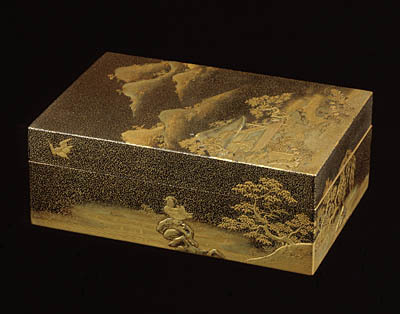 The decoration on the lid depicts a garden and a pavilion where Prince Kaoru is meditating, sitting beside his writing case. As a counterpoint to the latter, mountains rise in tiers against a hirameji ground, suggesting twilit distances in the manner of landscapes in Yamato-e style paintings. In the foreground, chrysanthemum and campanula stems bend under the autumn wind, a decoration that is repeated with the same naturalism on the back of the lid and on the inside shelf of the writing case. In addition, the case contains four incense boxes, the decoration of which evokes a chapter from book LII of the Tale of Genji (Genji monogatari): a bouquet of mauve flowers in a lacquered bowl, a nightingale singing among pine and plum tree branches, and a pair of grasshoppers on autumn flowers. In a style that blends sumptuous golds and delicate design, this writing case illustrates the eminently pictorial aspect of early 18th century lacquerwork. The technical perfection in no way inhibits the ethereal charm of expression, and the artist has managed to fully convey the nostalgic atmosphere of the “Tale of Genji”. Lacquer has been applied to the wood in several coats, each coat being successively dried then sanded. The maki-e (sprinkled paint) decorative technique consisted in sprinkling the gold and silver powder onto a lacquered decorative design and then covering it with further coats of lacquer. Poetic composition and calligraphy were the prerogatives of a wife of a lord or aristocrat. The writing case, paper box and low table formed an ensemble with a homogenous decoration. Such ensembles were widespread during the Edo period, characterized by the expansion of a new urban, middle-class culture that sprang from economic development and the prosperity of large cities.